Powerful, easy to operate software system for storing and managing customer records, service locations and service history with the additional capability to share data in real time over the network. Customer Manager For Workgroup is a must-have schedule management tool for any company and individual specializing service. It's perfect to plan working hours, keep track of scheduled appointments and orders. The program gives you a customizable Date Navigator and comprehensive reminder. It'll store the information about clients, such as their address, telephone, email and comments. Available is an automatic search and auto-field filling for a client, who has already been entered to the database. You can view the information about payments, daily income for any day at any moment when you need it. For those people, who work in Microsoft Outlook, it's possible to synch data. This modern and extremely handy program makes management a real pleasure. It allows any specialist to create a profile to run a personal schedule. The program enables users to switch between profiles to view the schedule of any staff member, it is also possible to view multiple profiles simultaneously or open the schedules of several specialists at the same time. All information stored in Customer Manager For Workgroup can be secured with a password preventing from unauthorized access. The program also has the Auto Backup feature that allows saving the data to the secured archive. What is important, the data from Customer Manager can be exported to many different formats, like iCalendar, MS Outlook, PDF, XML, HTML, XLS and TXT. The program has a built-in Print Designer, which offers a variety of original templates and options to make a fine and clear printout. You pay for the program only the first time and get all new versions of this program for FREE and for a lifetime! This new release includes performance improvements. 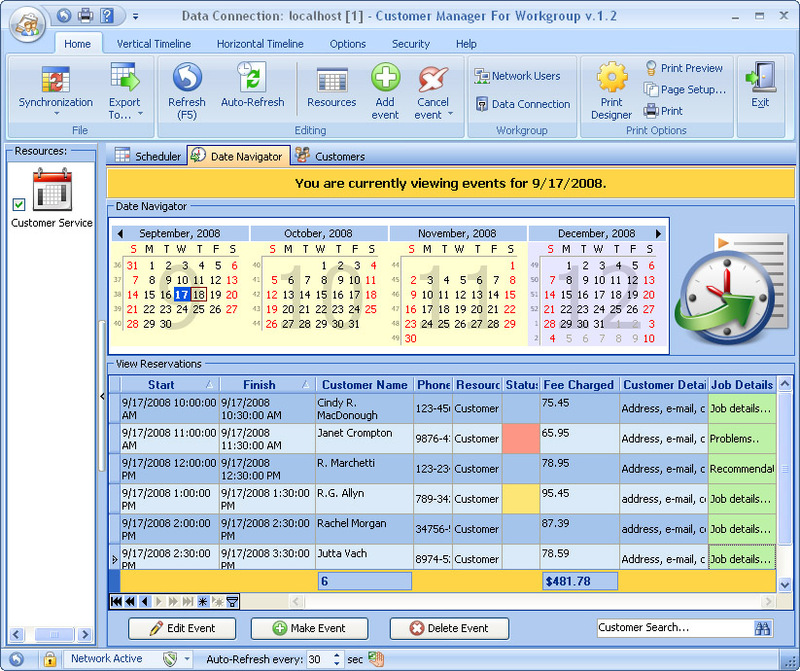 appointment,customer manager,calendar,scheduler,scheduling,organizer,planner,client manager,customer service software,appointments,staff scheduler,employee scheduling,client tracking,client management Powerful, easy to operate software system for storing and managing customer records, service locations and service history with the additional capability to share data in real time over the network.